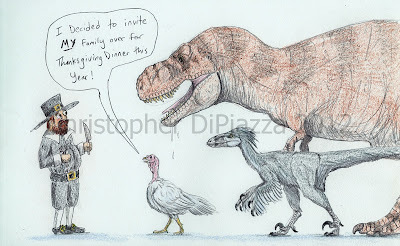 As you should know, birds are dinosaurs. Therefore the turkey you may be eating at Thanksgiving dinner is...a dinosaur. Because of this, back in 2012, I decided to doodle a little cartoon of this and post it on my facebook page. Here it is below. In case you were wondering the nonavian dinosaurs pictured are from left yo right: Dakotaraptor, Tyrannosaurus, and Dryptosaurus. All three members of the coelurosaur group, which also includes birds. Well this year I decided to do that cartoon again with a bit more care put in. (a bit...its still a sketch basically with paint on it.) Enjoy! As you enjoy your meal this Thanksgiving, remember to respect your bird because millions of years ago, its relatives were eating ours! 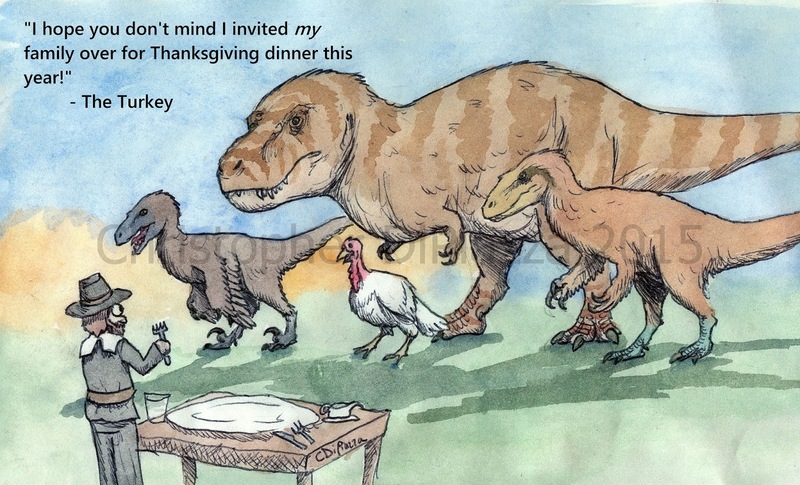 The redrawn cartoon is much, much better; I especially love the expression on the Rex's face, it's kind of like "This thing...it is for ALL of us?"